JKLCS Recruitment 2018: The Jammu and Kashmir Legislative Council Secretariat has issued official notification for 28 vacancies of Translator, Record Keeper, Typist and Cashier. 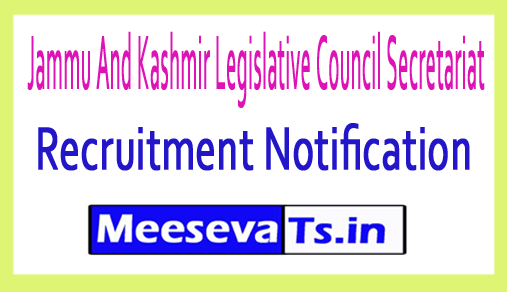 Eligible and skilled candidates are able to send Jammu and Kashmir Legislative Council Secretariat Jobs 2018 through their online mode from official website jklegislativecouncil.nic.in. Interested candidates can apply online for JKLCS Translator, Record Keeper, Typist, Cashier vacancy 2018 till the last date of 30-09-2018. Candidates can download official notifications from the official website before applying for this vacancy. Eligibility details such as qualification details, eligibility details below, important links, courses, admission papers, results, previous papers, how to get more information on education qualification, age limit, selection process, application fee and application to get more information about the recruitment of Jammu and Kashmir Legislative Council Secretariat. As shown below. Selected candidates will get Rs. 35,400 - 1,12,400 / - (1-4 posts), Rs. 25,500 - 81,100 / - (5 posts), Rs. 19, 9 00 - 63,200 / - (6-8 posts), Rs. 15, 9 00 - 50,400 / - (9-10 posts), Rs. 14,800 - 47,100 / - (11,12 posts) from the organization. Application fee for General / OBC category will be paid. 400 / -. Look around for "JKLCS recruitment 2018" for translator, record keeper, typist, cashier post.